NAJYRC CHRONICLES BY DEVON BROWN!!!!!! WESER EMS - ART ALSO WAS APPROVED WESER EMS/GERMAN RIDING PONY Not only was Art approved, but Holly Simensen - Inspector and Director of the Verband's North American Division, The Oldenburg Horse Breeders' Society, stated That Art is "Really really, the best young stallion for pony breeding in the US. For type he is outstanding". She was overwhelmingly complimentary about his termperament and movement. He also scored a 9 for jump! ART's first colt foal (Bookend's Celtic Rockstar) was inspected PREMIUM at his ISR/Oldenburg Sport Pony inspection. He scored 8 or above in all criteria. Another Intermediate - Devon and Dan successfully complete their second Intermediate at Poplar Place Farm placing a respectable 8th, and 1st out of the Young Riders that competed. Dan was very solid in the XC and show jumping. Dressage was tough as he was loaded on the trailer at 3:30 AM and had to wait around all day for his 3:30 dressage ride time..... He was cranky and felt sorry for himself and cried through the entire test. Devon maintained very well, but the judge was obviously not pleased, placing them LAST after dressage. It is sad to see the summer go along with the horses' nice sleek summer coats as the seasonally early cool nights have begun the dreaded process of growing winter coats. Summer was good, but it seemed we were consumed with Young Rider stuff the entire summer with no time for anything else. We started back the season with a run at Full Gallop last weekend. The big news is that DEVON AND DAN WENT INTERMEDIATE!!!! They finished a close second in an open division behind Tiffany Loudin Meetz and her multi time Rolex Horse Above and Beyond. It was a very exciting weekend, and we did it by ourselves - Go Team Hidden Creek!! Art and I went Prelim and aside from our worst dressage test (my bad as I knew better than to not use studs on early morning summer grass) we had a clear show jumping round and clean XC adding only 2 time faults and finished fifth. Art and Dan are quite funny (Irish maybe?) in that neither of them want to stretch out and gallop in warm up, but put them in the Start box and they go out like bats out of H__! We had some very sad news last month. Pebbles, the warmblood mare that I was leasing and in foal to Art had to be put down. She was Fay Bohlayer's very special mare and she will be missed. The good news is that another mare (Pebbles daughter) owned by Fay and bred at the same time as Pebbles, is doing fine and we will form a partnership with that foal. Other news last month, Art and I went out third level Dressage successfully. We scored a 61.5% at Thrid Test 1 and would have scored better had I rode a little smarter, but I was pleased for the first time for both of us. After all, that was only our third dressage show ever! Devon and I also did a Jumper show to prepare for Full Gallop. We both entered the 3'9" class and jumped around clean. That was very satisfying, and a great prep for the horse trial. We also added a new member to the HCH team. His name is SaffariO and he is a three year old Holsteiner/Dutch pinto. He is beautifully marked with an awesome temperament and going very well under saddle. Look for him early next year at BN! Next up, Poplar in a couple of weeks. We are so excited to introduce Art's first foal crop out of TB mares. The two on the ground are both stunning and displaying the wonderful Connemara temperament. Please visit our "2009 Foals" page for pics. 2009 Breeding Season is COMPLETE!!! Art settled all 12 of the mares bred this season. We are extremely excited about the quality and variety of mares he was put to in his first season shipping fresh cooled. The mares in foal include 3 purebred Connemaras, 1 half bred Connemara, 2 Dutch Warmblood Pintos, 4 TBs, 1 New Forrest Pony and 1 Appendix QH. Hidden Creek Horses extends a huge thank you to David and Julie Shannon for providing excellent Stallion Services at their Shannondale Farm in Alpharetta GA. We also want to thank all the mare owners and their Equine Veterinarians who did a tremendous job which resulted in such high stats for first cycle pregnancies (eleven of the twelve). Devon has begun the challenge of raising funds to help support the Young Rider Team this summer. She has secured an almost full time job babysitting. Her earnings will go directly to the Young Rider Fund. Sponsorship and donations have come along in all forms, and we thank all who have generously contributed to the Young Rider Fund. This weekend the Mandatory Young Rider Camp begins followed by the Selection Clinic. Then it is back to babysitting and conditioning for Dan until the Championships mid July. We'll try to squeeze in lessons here and there where we can. Unfortunately we will not be able to make the annual trek up to Blue Hill Farm this summer. We will truly miss seeing Missy, Jessica, and all the rest of the Blue Hill team. We will just have to plan for more time next winter in Ocala with Missy. HAPPY FUND RAISING TO ALL! It was a wet and muddy weekend but the Hidden Creek Horses (Art and Dan) rose to the occasion and out did the rest of the field of 20 in the Preliminary Rider Championship division finishing first and second! We trailered in each day to Chattahoochee Hills because it was only an hour from our farm. Art and Dan were incredibly amenable to working out of the trailer each day. They actually seemed to enjoy it - I think it was the constant supply of hay in front of their faces and a full water bucket right there to dunk their hay. What more could the two chow hounds ask for? After dressage Donna and Art were in 4th place and Devon and Dan were in 5th with respectable tests. It had rained over night and again before XC but our "mudders" perform their best in these conditions. With only one bobble after the corner combination, Art ran a fast and steady double clear round. There were only 3 other double clears in the division, and half of the 3 other Prelim divisions were littered with stops and time. Devon and Dan had their usual solid XC run and moved up to 3rd after XC. Donna and Art moved up to 2nd. Show jumping was even wetter than the day before, but they moved the arena to higher ground and the footing was good. Donna and Art had a decent round with one rail and were quite pleased to stay in 2nd. Devon and Dan were one of 4 double clears and moved up to WIN the division. Very exciting for us. What's up next? 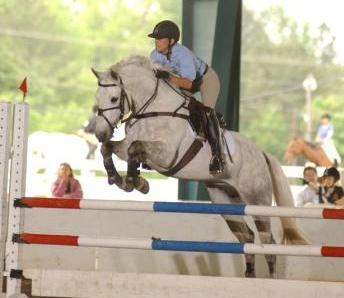 A clinic at Paradise Farm with Lucinda Green - Yah!!! May 2 and 3rd - There was a recognized HJ show a mile from out house and since we had a "free" weekend we decided to give it a try. Art and Dan went and brought home two Reserve Championships in the 3'7" Adult and Child Jumper Divisions, and the prize money paid for all the show fees except the grounds fee!!! It was a challenge for us, just to figure out the rules, but we really enjoyed it, and would do it again. I hope to be more prepared next time, as there is definitely a stategy to it. One thing that was hard to get use to is the fact that the closest they come to a schedule is a printed list of the classes in order of go. There is a lot of waiting, and oh by the way, if you read the program and thought you entered one type of class, you could very well get to the ring and find out it changed. Art and Dan were troopers and are quite happy to be relaxing on the nice spring grass tonight! I will post a pic of Art, as soon as I figure out how to read the disc they gave me! Art successfully passed the ISR/Oldenburg NA Sport Pony Division inspection and secured a lifetime breeding license. He scored all 7's for dressage and all 8's for the jumping criteria. The breeding season is upon us and we are very busy. We did not have much time for Spring competitions except for Poplar in late March. Aside from the weather, it went well, but nothing very exciting to report. Art stayed home for this one and will be back competing in May at the Area 3 championships. His schooling outings have been great - the winter layoff seems to have been refreshing for him. My international travel is coming to a conclusion. Finally. I am really looking forward to focusing on family and horses again. I must admit the finale was a fabulous exercursion in NZ which gave me the great fortune to meet several of it's Connemara enthusiasts and breeders thanks to Sheila Ramsey. Sheila set up a whirlwind trip for me that went from Auckland to Christchurch to Palmerston North and back to Auckland. I had the good fortune to meet Shiela, Penny Mahy, Glorianne Mullen, Sharyn and Fen Greer (and their frined Caetrina), and Liz Gillespie. I loved every minute of it and appreciate everyone taking so much time from their busy schedules to show me their ponies. 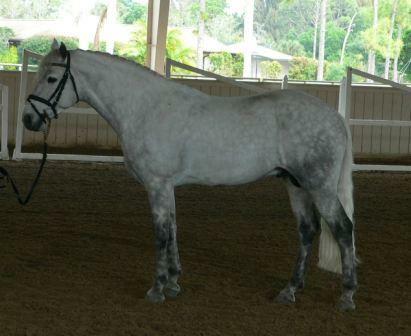 Next up, ISR/Oldenburg Sport pony inspection in Jupiter Florida and a weekend with Missy at Longwood. After that, the Poplar CIC* for Devon and a Novice run for Mr. Monte. OKay, so I said no events until March....well we did manage to sqeeze Pine Top in for Devon last weekend (Valentine's weekened) in between my travels. They had an awesome run, winning the dressage, no rails stadium, and an easy go cross country to finish first in JYOP. I truly enjoyed spectating and we had a great time with only one horse and rider to worry about. Next up - ISR/Oldenburg inspections in Jupiter Florida and a weekend with Missy R at Longwood. CAN'T WAIT! Much belated Happy New Year to all. The year started off way too busy for my liking, especially since it was hardly related to our equines. Competitions are pretty much on hold until March, so we really don't have much to write about. All the boys have been enjoying some much deserved time off. We hope to start off the Spring with a few events in March which we are really looking forward to. Breeding season is fast approaching and we are starting to get the season lined up, which of course brings on some excitement. We are also anxiously waiting to hear news of the mares bred to Art last season.